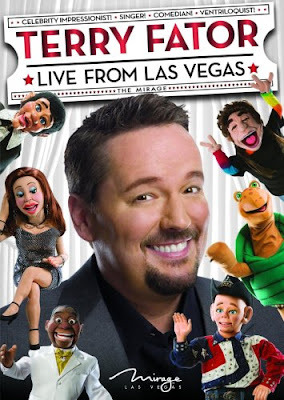 On his new DVD, Live from Vegas, Season 2’s America’s Got Talent winner Terry Fator proves that he is extraordinarily talented and that his show is equally extraordinarily difficult to sit through. The cringing started shortly after hitting the play button because although Fator is clearly one of the best singing-ventriloquist-impressionists around, his very hokey, starchy show is a snoozefest on valium. There is an audience for this kind of cheesy garbage, I know, I wait behind them sometimes at traffic lights screaming, but they are best avoided when possible. The show does have moments that emerge from the middle-American grey, dullness such as when Terry pulls an audience member on stage and adds a mask and dress using the live person as a doll very effectively, but everything is so scripted any reality is quickly shooed offstage. I’m sure Terry is a nice guy because he said so in the first chapter of his autobiography which was included with the DVD “Who’s The Dummy Now?” (answer: anyone reading the book) in which he tells his story of rags to riches slowly and painfully. Another added bonus is the worst audio commentary ever recorded featuring Terry and his comedy writer who is so far from the microphone that he might be down the block running from the nightmare. It may play well in Peoria and fill seats at the Mirage, but after watching his act Terry Fator’s fan club is probably just hearing about this great new thing called the internet.